Lentils transform from a simple one note into something with an amazing flavor profile when cooked in Massel liquid stock. It does the same thing to any vegetable you choose to roast. This makes a hearty satisfying dish for lunch or dinner, but make extra because the cold leftovers even taste great. Use whatever vegetables that are in season. Keeping the vegetables cut in big chunks adds to texture. Serve with yogurt/vegan yogurt to add a mellow creamy tang that compliments the earthy notes in the dish, if you would like. There are no exact measurements with this dish because you can make one serving to 10. You can add as many vegetables to the lentils as you desire. Make this dish your own. 1.) Toss seasonal vegetables in olive oil and 2 tablespoons Massel Concentrated Liquid Stock. Make sure that vegetables are cut uniformly in size to ensure they cook evenly. Place on baking sheet in a single layer. 2.) In a preheated oven of 400°F, roast vegetables until they are tender and slightly browned on the outside (25-35 minutes). 3.) While your vegetables are roasting, cook your lentils. (Note: One cup of lentils with 2 cups of Massel stock is the ideal ratio for boiling; adjust for desired amount.) When the lentils are tender and not chewy, take them off the heat and drain if there is any remaining liquid. 4.) 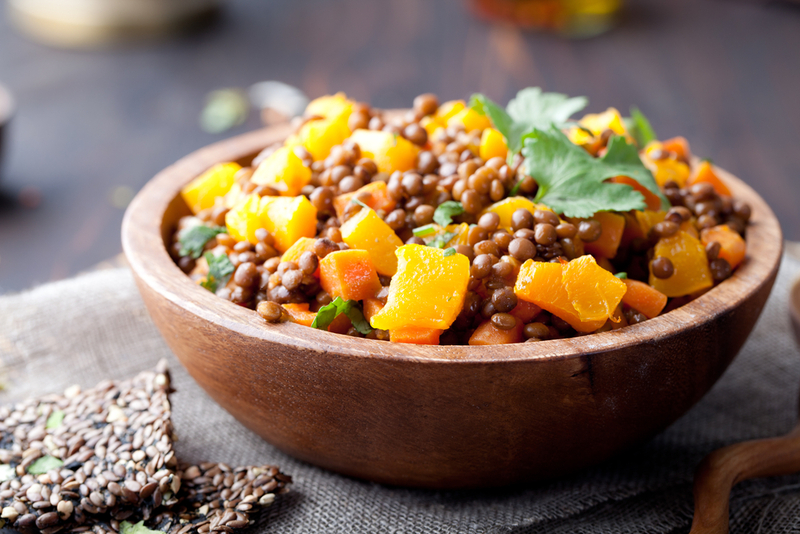 When vegetables and lentils are cooked, combine in a large bowl and toss with olive oil, dill and pepper. 5.) Serve warm or at room temperature with yogurt and mint, if desired. Enjoy!